ANCIENT SATANISM/PAGANISM BEING MAINSTREAMED IN TODAY'S "CHURCHES"
The ancient labyrinth or spiral is now being touted as a means of "healing" and meditation in churches throughout the United States. This event is another indication America has turned Pagan, which it must do if her people are to be ready for Antichrist. NEWS BRIEF: "Rediscovering The Labyrinth: Unlike mazes, these ancient circular pathways guide walkers to their spiritual, healing or creative center", by David Crumm, Knight Ridder Newspapers, in The Providence Journal, Saturday, July 11, 1998, page D5. "The mysterious labyrinth is merely 11 interlocking circles laid out on the ground with the outline of a six-petaled flower at its heart. But a growing number of men and women who have stepped inside the ancient pattern say that they have found relaxation, reassurance, and even healing within its winding paths." " 'All of these things are a part of our spiritual health', says the Rev. Murray Blackadar, Pastor of the Church of Our Savior in West Bloomfield, Mich., where members have just built a 60-foot-wide labyrinth of stone and grass. 'In exploring the labyrinth, we are rediscovering what people in other centuries understood about mental, physical, and spiritual wholeness', Blackadar says." "Blackadar, standing nearby, adds, 'One thing I like about using the labyrinth is that it's not just another spiritual flavor of the month that someone has thought up. There's a real history behind this in Christianity and we're tapping into that history in a serious way ... The widespread rediscovery of labyrinths is too recent to be reflected in most reference books. 'This is a Christian tradition, but it is found in many other religions as well', says the Rev. Lauren Artress of Grace Episcopal Cathedral in San Francisco and the world's leading promoter of labyrinths." At this point, I paused in reading this article because I had certainly never, ever seen a circular labyrinth in any Christian literature, nor any in Jewish literature, nor in the Bible. But, before we get into the kind of Christianity to which the "Reverend" Blackadar is referring, let us look at the labyrinth in question here. Within this article, Rev. Artress gives her URL for anyone who wants to see what a labyrinth looks like and to get more information about starting a labyrinth in his or her community. This URL address is www.gracecom.org/veriditas/ Let us now look at her picture of her labyrinth. As you can see, this labyrinth is a stylized series of coiled circles. Let us return to this newspaper article for more information that will further enlighten us about this labyrinth. "While the intricate circular pathways may seem puzzling at first, labyrinth devotees are quick to point out that this pattern is not a maze. Mazes are puzzles designed to confuse people with wrong turns and dead ends. In contrast, labyrinths twist and turn in surprising ways, but there is only one pathway and it always leads walkers into the center and back out again." (Ibid.) In other words, this pattern is one of circles within circles. When I read this description of the labyrinth in this article, I was reminded of another circle similarly composed of circles within circles. Where was it that I had seen another series of circles within circles? Within minutes, I remembered. I took my Satanic book of symbols, "Magic Symbols", and turned to their circles within circles. Look at what I found on page 123. This design was discovered on the Norman front in the parish church at Lewannick, Cornwall. Notice the design is essentially the same as the design of the labyrinth shown on the web site of Veriditas, above. The only major difference between the two circles within circles is that this one is not interrupted at all with the stylistic designs, as is the Veriditas. This design is very occultic, of course, which is why it was displayed in the "Magic Symbols" book in the first place. But, the degree to which it is occultic will shock you. 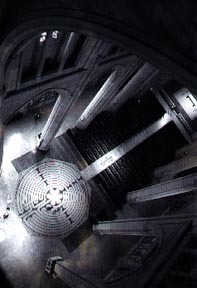 Now, let us look at the original labyrinth design, after which all others have been adopted. Now, we can clearly see that the labyrinth design was adopted from the coiled serpent! 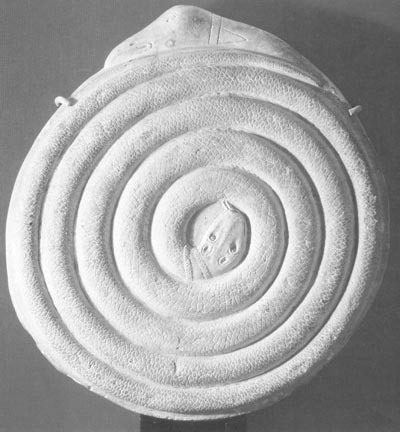 Notice the head of the serpent in the very middle of the coil, with its tongue protruding. We should not be surprised at this proof of Paganism in this modern labyrinth, because the New Age Movement is simply a revival of the old Satanic Babylonian and Egyptian Mysteries religions, which common elements of Buddhism and Hinduism thrown in for good measure. To dispel any ideas that the similarities of the labyrinth to the coiled serpent is accidental, let us examine the supposed effects of these two symbols upon the adherent who places great faith in it. First, let us examine the newspaper article to see the effect upon the people who "religiously" walked the labyrinth.
" 'I couldn't tell you much about the theology behind this or the meaning of all the circles, Atwell says, but I know that, for me, walking the labyrinth is like taking a journey through my life." In the 15 or 20 minutes it takes Atwell to reach the flower-shaped center and prepare for his journey back out of the labyrinth into the ordinary world, he has passed through a virtual photo album of the most beloved scenes in his life." " 'The beauty of the labyrinth is that it can address so many needs', says Rev. Artress. 'It can be a prayer tool in a church; it can reduce stress in a hotel setting; it can heal; it can inspire an artist'." "The potential for reducing stress and soothing anxiety makes the labyrinth ideal for a medical center, says Dr. Katherine Roth, a family practitioner who has studied ways to integrate nutrition, exercise, stress reduction and meditation into healing." "For two years, Roth has led the effort to build a large garden and labyrinth outside Sparrow Hospital in Lansing, Mich. 'There's a difference between curing and healing,' Roth says. 'Curing is something that we do to deal with a disease process or a symptom you may have. But healing is an innate process within each of us that allows us to bring back a balance in our lives'." "Researchers at several major medical schools, including Harvard and Duke, have demonstrated in clinical tests that some forms of meditation can reduce blood pressure, slow metabolism, and even ease chronic pain. No one has clinically tested the labyrinth, Roth says, but it is possible that the quiet sense of relaxation many people report while walking the winding paths may produce similar results." Now, let us examine the many benefits said to incur to people who place faith in the coiled serpent symbol, here called a "spiral", in this Satanic book, "Magic Symbols". "The spiral is a magical symbol intended to depict the mystical journey to the centre, where 'illumination', 'wisdom', or 'insight' will be found. The drawing of the spiral has the caption, 'All things lead to the One'." How convenient! We are currently in the time of world history where the many religions in the world are uniting into one religion, which will be the prophesied religion of Antichrist. In sparking the popularity of the labyrinths, Satan is moving Americans of many different religions into the worship of the "One". How many different religions were mentioned in this article? Unitarian Universalist Church -- We should not really be too surprised about this revelation, since the Unitarian Universalist Churches have been actively promoting worship of Buddha and of The Christ [Antichrist], even to the point of supporting Benjamin Creme in his efforts to be the "John the Baptist" forerunner to Antichrist. We encourage you to go to the Veriditas web site, www.gracecom.org/veriditas/ so you can study all the places in this country which are currently using labyrinths in their "worship" and "healing". Now, we come back full circle to the mysterious statement at the beginning of this article that the labyrinth dated back to Christian roots. The "Christian" roots turn out to be none other than Roman Catholic "Christianity"! Of course, we have spent considerable time and effort to demonstrate that Roman Catholicism is simply Counterfeit Christianity. In reality, Catholicism is nothing more than ancient Paganism dressed up in Christian clothes. This example is nothing more than another sorry example of Paganism that has been brought into the Catholic Church. In this instance, this serpent labyrinth was rediscovered by Artress embedded in the floor of the Roman Catholic Chartes Cathedral in France. This 11-foot circle labyrinth was laid in approximately 1200 A.D. Even though the people of Chartres had no idea what the worship of the labyrinth meant, even though they had no idea they had a coiled serpent symbol lying in the floor of their church, this incident clearly shows the inherent, original Paganism in the Roman Catholic Tradition. 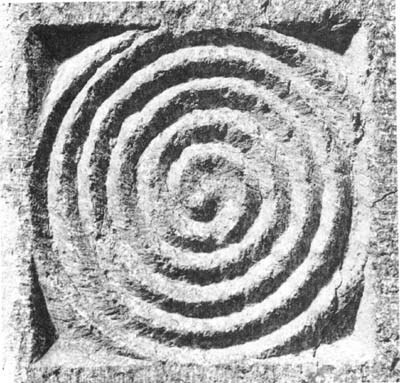 The worship of the coiled serpent in this practice of using the labyrinth in which to meditate and commune with the centre of your being clearly shows that Paganism has become Mainstream in America today. The picture that accompanied this article shows four women dressed in typical American clothing walking the path of the coiled serpent. Of course, we have been warning for some time now that, before Antichrist could arise, all peoples of the world had to be sufficiently comfortable with Paganism in their everyday lives. Americans have always been the greatest impediment to the appearance of Antichrist because of our long, thorough Christian heritage. Now, this Christian heritage is being rapidly eroded, probably to the place where Antichrist could arise; after all, his Guiding Spirits have assured him that, immediately after he arises, those nasty Christians who could never accept him would be taken out of this dimension [The Rapture of the Church; See NEWS1052 for full details]. Thus, Antichrist is assured that he will be left with nothing but Pagans in the world. The time of the End is getting very close, as this story clearly reveals. Are you spiritually ready? Is your family? Are you adequately protecting your loved ones? This is the reason for this ministry, to enable you to first understand the peril facing you, and then help you develop strategies to warn and protect your loved ones. Once you have been thoroughly trained, you can also use your knowledge as a means to open the door of discussion with an unsaved person. I have been able to use it many times, and have seen people come to Jesus Christ as a result. These perilous times are also a time when we can reach many souls for Jesus Christ, making an eternal difference.